In 1980 when I was 11 years old I woke up to a very strange site. Grey dust covered the cars, the grass, the rooftops – everything. It was like an unseasonable frost or a covering of very light snow. It was ash. 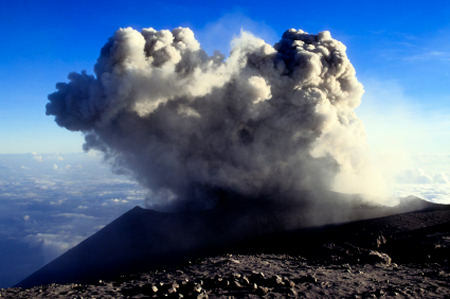 Mt st Helens had erupted the day before spewing a fine ash into the atmosphere; the winds carried it north, east and south. My little town, though hundreds of miles away, was dusted with the ash. To us the eruption was nothing, a mere inconvenience that ruined a few too-fussy-for-ranch-land auto-finishes and otherwise was harmlessly washed away. Near the epicenter it had been a pyroclastic nightmare that had leveled trees, filled lakes and killed everything it touched. This morning I was reading about the potential of the FOCA being passed and how this might well create a crisis in Catholic Hospitals which are currently exempted from having to perform abortions by various conscience provisions. Our Bishops have shown almost uncharacteristic zeal on this issue. There is a real fire burning in Baltimore. I read Auxiliary Bishop Robert Hermann’s magnificent statement that “any one of us would consider it a privilege to die tomorrow — to die tomorrow — to bring about the end of abortion“, there is a thrill in my heart. Our Bishops, American Bishops are saying something like this? It is almost beyond belief. But there it is. After reading Melinda Henneberger’s excellent article at Slate I am convinced, as she is that FOCA is a real threat to Catholic health care. The threat is not from the Bishops, they are simply stating the obvious. If faced with the choice to perform abortions or not take federal funds they will stop taking federal funds. If they stop taking federal funds they won’t be able to cover operating expenses and will have to close. The outrage from the pro-Obama quarter is as incendiary as you would expect. The Big Horrible Catholic Hierarchy is trying to force the Poor Permanent Victim Class of Woman into the back-alley to obtain their Fundamental Reproductive Rights. But I think rightly viewed the Bishops are neither blustering nor threatening per say. What they are doing is stating firmly that they can not, and will not, do immoral things no matter the consequence. If there is an attempt to force them to do evil they will opt out entirely. The media will certainly frame this as the Church being horrible, medieval or intolerant, but public opinion really can’t come into play here. The Church is at her worst when she plays to public opinion and at her best when she says what is true boldly and honestly with no care to the world’s view of her. But I am concerned that this has the potential for getting really seriously bad for Catholics, Christians in general maybe, but certainly for Catholics. It seems a fine haze of ash is filling the air. Is it from the dead wood burning away leaving out Bishops with a clear sense of purpose and mission? Is it the remains of personal liberty and the ability of institutions and even individuals to act in a manner consistent with the consciences? Maybe it is all that or even more. Only time will tell, it is our job to wait and pray. « Portland is a little weird. You are currently reading Ash falling like snow at Simply Catholic.